A 52-year-old woman presented with a complaint of neck swelling. The patient showed signs of hyperparathyroidism: hypercalcemia, and hypophosphatemia. 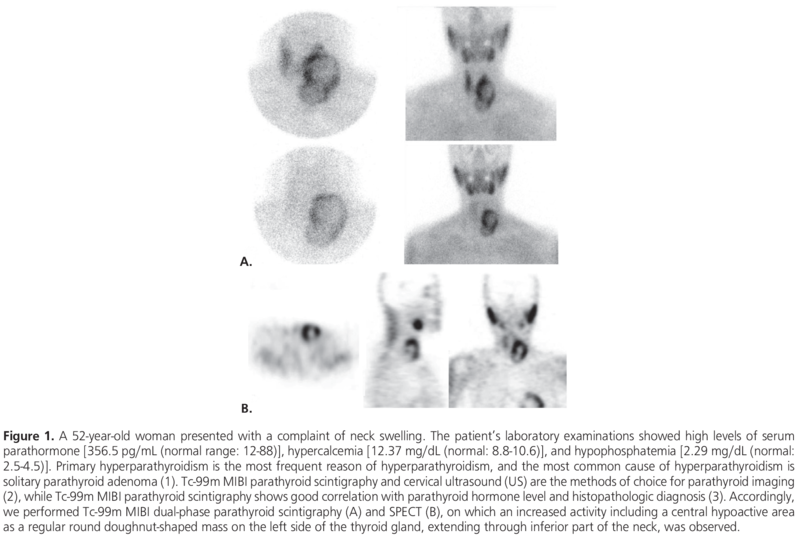 Tc-99m MIBI dual-phase parathyroid scintigraphy and SPECT revealed increased activity in a regular-bordered, “doughnut”-shaped mass on the left side of the thyroid gland with a central hypoactive area. 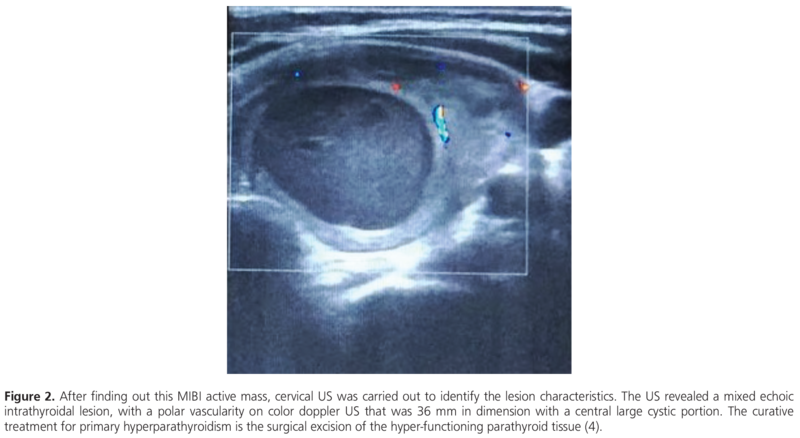 The cervical ultrasound identified a mixed echoic thyroid nodule with a central large cystic portion, and no parathyroid gland abnormality. Total thyroidectomy and parathyroid exploration was performed. 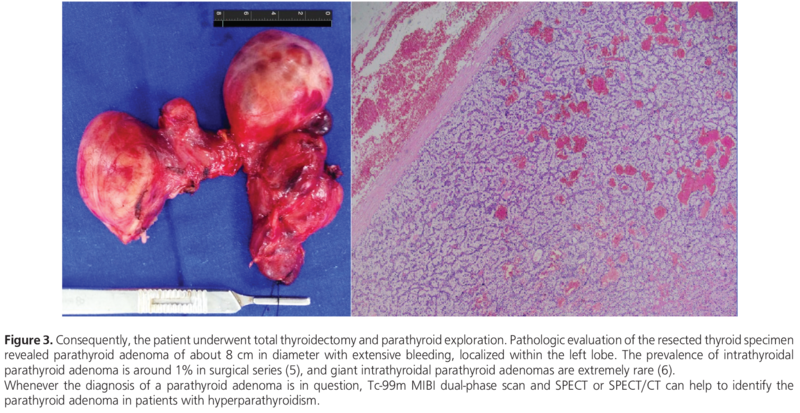 Pathological evaluation of the resected thyroid specimen reported a giant intra-thyroidal hemorrhagic parathyroid adenoma. Surgical and Medical Practices: C.A., A.T., Concept: D.Ç., M.B., Design: D.Ç., Data Collection or Processing: D.Ç., M.B., M.E., Analysis or Interpretation: D.Ç., S.S.G., Literature Search: D.Ç., M.B., Writing: D.C., M.B. Ruda JM, Hollenbeak CS, Stack BC Jr. A systematic review of the diagnosis and treatment of primary hyperparathyroidism from 1995 to 2003. Otolaryngol Head Neck Surg 2005;132:359-372. Hindié E, Ugur O, Fuster D, O’Doherty M, Grassetto G, Ureña P, Kettle A, Gulec SA, Pons F, Rubello D; Parathyroid Task Group of the EANM. 2009 EANM parathyroid guidelines. Eur J Nucl Med Mol Imaging 2009;36:1201-1216. Silov G, Özdal A, Erdoğan Z, Turhal Ö, Karaman H. The Relationship Between Technetium-99m-Methoxyisobutyl Isonitrile Parathyroid Scintigraphy and Hormonal and Biochemical Markers in Suspicion of Primary Hyperparathyroidism. Mol Imaging Radionucl Ther 2013;22:8-13. Silverberg SJ, Shane E, Jacobs TP, Siris E, Bilezikian JP. A 10-year prospective study of primary hyperparathyroidism with or without parathyroid surgery. N Engl J Med 1999;341:1249-1255. Goodman A, Politz D, Lopez J, Norman J. Intrathyroid parathyroid adenoma: incidence and location the case against thyroid lobectomy. Otolaryngol Head Neck Surg 2011;144:867-871. Vilallonga R, Zafón C, Migone R, Baena JA. Giant intrathyroidal parathyroid adenoma. J Emerg Trauma Shock 2012;5:196-198.